Lung cancer is a common malignant cancer, 80% of which is Non-Small Cell Lung Cancer (NSCLC) [1-3]. In the recent years the epidemiological surveys have shown that the morbidity of NSCLC is continuously increasing, significantly affecting the physical and psychological health of patients [4-6]. Several clinical researches have shown that EGFR is overexpressed in 40%-80% NSCLC [7-9]. NSCLC with mutated EGFR kinase domain shows histological characteristics of adenocarcinoma, which is highly sensitive to TKI [10-12]. However, almost all the EGFR mutated patients who are sensitive to EGFR-TKI initial treatment are deteriorated after 1 y. This is defined as EGFR-TKI resistance clinically. Thus, a new therapeutic regimen is urgently needed to solve EGFR-TKI resistance [13-15]. In recent years, the antitumor drugs (such as erlotinib and gefitinib) targeting on EGFR have significantly improved the survival rate of NSCLC and changed the therapeutic pattern of lung cancer [16-19]. This study focus on the effects of pemetrexed combined with gefitinib on the life quality of patients with EGFR-TKI resisted advanced NSCLC. 78 advanced NSCLC patients who had EGFR-TKI resistance admitted in our hospital between June 2013-2015 were included. All the patients were conformed to the acquired resistance criteria made by Jackman and were slowly progressive . The patients were randomly divided into observation group (n=39) and control group (n=39) according to the random number table. In the observation group, there were 24 male patients and 15 female patients, the age was 42-75 y old and the average age was 60.39 ± 4.16 y old, the histological type: 32 cases of adenocarcinoma and 7 cases of squamous carcinoma, the median time of TKI treatment before resistance was 11.64 ± 2.45 months. In the control group, there were 23 male patients and 16 female patients, the age was 40-74 y old and the average age was 59.81 ± 3.79 y old, the histological type: 34 cases of adenocarcinoma and 5 cases of squamous carcinoma, the median survival time of TKI treatment before resistance was 11.43 ± 2.51 months. This study was approved by the Ethics Committee of our hospital, and all the patients signed the informed consent. The general data of two groups were not statistically different (P>0.05), which was comparable, as shown in Table 1. Table 1. Comparison of baseline data between two groups. Cancer is controlled by EGFR-TKI for more than 6 months, and the original lesion is slightly enlarged or there were 1-2 non-targeted lesions. Control group: Oral administration of 250 mg gefitinib once per day (AstraZeneca Pharmaceutical Co., Ltd. London, UK). Observation group: 4 drops of 500 mg/m2 pemetrexed (Hansoh Pharmaceutical Co., Ltd. Lianyungang, China) for every 21 d combined with gefitinib. 21 d was set as one cycle and the therapeutic effect was evaluated after 2 cycles. Complete remission (CR): The legion is gone for more than 4 weeks. Partial remission (PR): The lesion size is decreased by more than 30% for more than 4 weeks. Progressive disease (PD): The lesion size is increased by more than 20% or there is new lesion. Stable (SD): The status between PR and PD. The Quality of Life Questionnaire for Chinese Cancer patients receiving chemobiotherapy (QLQ-CCC) and Karnofsky Performance Status (KPS) in two groups before and after the treatment were evaluated. QLQ-CCC includes somatic, physical, social and overall scores. The higher QLQ-CCC or KPS scores suggest better life quality; the change of immune indexes, including CD3+, CD4+, CD4+/CD8+ in two groups before and after treatment was evaluated. 3 ml venous blood was collected from the patients before and after the treatment, and 50 μl completely mixed anticoagulated whole blood was added in. Then 20 μl CD3/CD4/CD8 antibodies were added and kept in the darkness for 15 min. 450 μl 1 × FACS hemolysin was added in the sample and thoroughly mixed, kept in the darkness for 15 min, at last the samples was detected by flow cytometer within 24 h. The median survival time and non-progressive survival time of two groups were evaluated. The toxic and adverse reactions of two groups were observed. The data was analyzed by SPSS19.0 (International Business Machines Corp., New York, USA). The measurement data were analyzed by t-test and the enumeration data were analyzed by Chi-squared test. Kaplan-Meier survival analysis was applied and the survival was compared by Log-rank test, P<0.05 was defined as statistically significant. As shown in Table 2, the short-term effects were not statistically different between two groups (P>0.05). Table 2. Comparison of short-term therapeutic effects between two groups. As shown in Table 3, before treatment QLQ-CCC and KPS scores were not statistically different between two groups (t=0.5285, 0.8463, 1.6256, 0.8360, 0.5916, P>0.05). QLQCCC and KPS scores of the two groups were increased after treatment, which were statistically different (in the control group t=11.0018, 10.3165, 7.0910, 22.0391, 46.4797, in the control group t=5.9088, 4.6628, 4.5348, 11.9525, 24.6582, P<0.05). Note: *P<0.05 compared with before treatment in the same group; #P<0.05 compared with the control group after treatment. Table 3. Comparison of QLQ-CCC and KPS between two groups before and after treatment (͞x ± s). After treatment the QLQ-CCC and KPS score in the observation group were higher than the control group, which were statistically different (t=5.3320, 6.1108, 4.1673, 10.7847, 21.3616, P<0.05). As shown in Table 4, before treatment CD3+, CD4+ and CD4+/CD8+ were not statistically different between two groups (t=0.2895, 0.5194, 0.8327, P>0.05). After treatment CD3+, CD4+ and CD4+/CD8+ in the control group were not statistically different from before treatment (t=0.3099, 0.7856, 0.9591, P>0.05). After treatment CD3+, CD4+ and CD4+/ CD8+ in the observation group were increased, which were statistically different (t=7.1652, 5.3400, 5.4006, P<0.05). After treatment CD3+, CD4+ and CD4+/CD8+ in the observation group were higher than the control group, which were statistically different (t=8.2899, 4.6675, 5.2571, P<0.05). Table 4. Comparison of immune function indexes between two groups before and after treatment (͞x ± s). 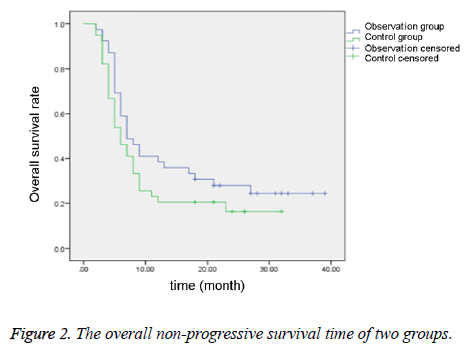 As shown in Table 5 and Figures 1-2, the median survival time and the non-progressive survival time in the observation group were longer than the control group, which were statistically different (P<0.05). Figure 1: The overall survival of two groups. Figure 2: The overall non-progressive survival time of two groups. Table 5. Comparison of median survival time and non-progressive survival time between two groups. As shown in Table 6, the toxic and adverse reaction rates were not statistically different between two groups (P>0.05). Table 6. Comparison of toxic and adverse reaction between two groups. The EGFR mutated site in NSCLC is mainly located at the intracellular coding domain, including deletion mutation of exon 19 and point mutation of exon 21, which are 90% of all the EGFR kinase mutation [21,22]. It is also related to the sensitivity of EGFR tyrosine-kinase inhibitor. Generally speaking, the sensitivity of EGFR mutated NSCLC patients to TKI is high. Furthermore, EGFR tyrosine-kinase inhibitor can block the tyrosine autophosphorylation in EGFR molecule to inhibit the formation of EGFR homo-dimer by competitively combining the extracellular ligand-binding site against ATP or substrate. This can further inhibit EGFR activation, block the downstream signal transduction, inhibit angiogenesis and metastasis, accelerate cell apoptosis and inhibit cell cycle progress [23-25]. However, in the clinical practice, most of patients are not sensitive to EGFR-TKI, or there is resistance after a period. Some scholars have shown that stopping EGFRTKI in EGFR-TKI acquired resistance patients will cause aggressive progress of the cancer . Thus, taking effective measures to treat the patients with EGFR-TKI resistance is very important. As the approval of pemetrexed and gefitinib application, it brings a new hope for the NSCLC patients after the failure of first-line treatment . Pemetrexed has good therapeutic effects on various cancers especially NSCLC, and the effects are better in adenocarcinoma than squamous carcinoma in the first-line treatment. The anti-tumor effect of pemetrexed is mainly through interfering the metabolic pathway of folic acid during cell replication, and it can also obviously inhibit the activity of folic acid dependent coenzyme [28,29]. Gefitinib a second line chemotherapy drug approved for lung cancer treatment, which is an EGFR tyrosine-kinase inhibitor. It can competitively combines with the ATP binding site against EGFR tyrosine-kinase inhibitor and inhibit autophosphorylation, which further blocks the downstream signal transduction to inhibit cancer cell proliferation and promote cancer cell apoptosis to exert anticancer effects [30-32]. In this study, the results showed that the short-term effective rate was 53.85%, suggesting that the short-term therapeutic effect of pemetrexed combined with gefitinib is significant. In the observation group, after treatment the QLQCCC and KPS scores were both higher than the control group, suggesting pemetrexed combined with gefitinib can improve the life quality of patients. After treatment the CD3+, CD4+ and CD4+/CD8+ in the observation group were higher than the control group, suggesting that pemetrexed combined with gefitinib can improve the immune function of patients. The median survival time and non-progressive time in the observation group were longer than the control group, suggesting that pemetrexed combined with gefitinib can prolong the median survival time and non-progressive time. In conclusion, pemetrexed combined with gefitinib has good effects on EGFR-TKI resisted advanced NSCLC. This may significantly improve the patient life quality, improve the immune function, and prolong the median survival time and progression-free survival time, which is significant in NSCLC patients. Caroli G, Dolci G, Dell'Amore A, Asadi N, Greco D, Chadi A, Bini A, Stella F. Video-assisted thoracoscopic lobectomy for non-small cell lung cancer: a morbidity limiting approach in a patient on chronic hemodialysis and double agent antiplatelet therapy. Gen Thorac Cardiovasc Surg 2015; 63: 177-180. Linden D, Linden K, Oparka J. In patients with resectable non-small-cell lung cancer, is video-assisted thoracoscopic segmentectomy a suitable alternative to thoracotomy and segmentectomy in terms of morbidity and equivalence of resection? Interact Cardiovasc Thorac Surg 2014; 19: 107-110. Senbaklavaci O, Taspinar, H, Hartert M, Vahl CF. Impact of previous cardiovascular surgery on postoperative morbidity and mortality after major pulmonary resection for non-small cell lung cancer. Langenbecks Arch Surg 2013; 398: 903-907. Li X, Zhou C, Hu W. Association between serum angiotensin-converting enzyme 2 level with postoperative morbidity and mortality after major pulmonary resection in non-small cell lung cancer patients. Heart Lung Circ 2014; 23: 661-666. Otake S, Ohtsuka T, Asakura K, Kamiyama I, Kohno M. Impact of comorbidity index on morbidity and survival in non-small cell lung cancer. Asian Cardiovasc Thorac Ann 2016; 24: 30-33. 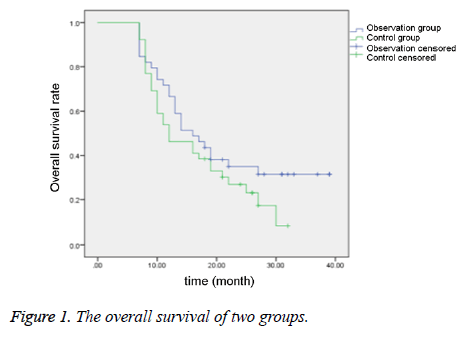 Stolz AJ, Harustiak T, Simonek J, Schutzner J, Lischke R. Pneumonectomy for non-small cell lung cancer: predictors of early mortality and morbidity. Acta Chir Belg 2014; 114: 25-30. Sheikine Y, Rangachari D, McDonald DC, Huberman MS, Folch ES, VanderLaan PA, Costa DB. EGFR testing in advanced non-small-cell lung cancer: A mini-review. Clin Lung Cancer 2016; 17: 483-492. Xu J, Yang H, Jin B, Lou Y, Zhang Y, Zhang X, Zhong H, Wang H, Wu D, Han B. EGFR tyrosine kinase inhibitors versus chemotherapy as first-line therapy for non-small cell lung cancer patients with the L858R point mutation. Sci Rep 2016; 6: 36371. Yang S, Chen X, Pan Y, Yu J, Li X, Ma S. Proteins associated with EGFR-TKIs resistance in patients with non-small cell lung cancer revealed by mass spectrometry. Mol Med Rep 2016; 14: 4823-4829. Garassino MC, Broggini M. Chemotherapy versus tyrosine kinase inhibitor in EGFR unselected population advanced non-small cell lung cancer still matter of debate?-An update incorporating the DELTA trial data. J Thorac Dis 2015; 7: 224-226. Park S, Keam B, Kim SH, Kim KH, Kim YJ, Kim JS, Kim TM, Lee SH, Kim DW, Lee JS, Heo DS. Pemetrexed singlet versus non pemetrexed-based platinum doublet as second-line chemotherapy after first-line Epidermal Growth Factor Receptor (EGFR) tyrosine kinase inhibitor failure in non-small cell lung cancer patients with EGFR mutations. Cancer Res Treat 2015; 47: 630-637. Tang J, Guo F, Du Y, Liu X, Qin Q, Liu X, Yin T, Jiang L, Wang Y. Continuous exposure of non-small cell lung cancer cells with wild-type EGFR to an inhibitor of EGFR tyrosine kinase induces chemoresistance by activating STAT3. Int J Oncol 2015; 46: 2083-2095. Hata A, Katakami N, Yoshioka H, Kaji R, Masago K, Fujita S, Imai Y, Nishiyama A, Ishida T, Nishimura Y, Yatabe Y. Spatiotemporal T790M Heterogeneity in Individual Patients with EGFR-Mutant Non-Small-Cell Lung Cancer after Acquired Resistance to EGFR-TKI. J Thorac Oncol 2015; 10: 1553-1559. Luo YH, Chen YM. Recent advances in the development of mutant-selective EGFR inhibitors for non-small cell lung cancer patients with EGFR-TKI resistance. Transl Lung Cancer Res 2014; 3: 368-369. Yoshida T, Zhang G, Smith MA, Lopez AS, Bai Y, Li J. Correction: tyrosine phosphoproteomics identifies both co-drivers and co-targeting strategies for T790M-related EGFR-TKI resistance in non-small cell lung cancer. Clin Cancer Res 2015; 21: 3571. Smit EF, Wu YL, Gervais R, Zhou C, Felip E, Feng J, Guclu SZ, Hoiczyk M, Dorokhova E, Freudensprung U, Grange S, Perez-Moreno PD, Mitchell L, Reck M. A randomized, double-blind, phase III study comparing two doses of erlotinib for second-line treatment of current smokers with advanced non-small-cell lung cancer (CurrentS). Lung Cancer 2016; 99: 94-101. Zenke Y, Umemura S, Sugiyama E, Kirita K, Matsumoto S, Yoh K, Niho S, Ohmatsu H, Goto K. Successful treatment with afatinib after grade 3 hepatotoxicity induced by both gefitinib and erlotinib in EGFR mutation-positive non-small cell lung cancer. Lung Cancer 2016; 99: 1-3. Hsiue EH, Lee JH, Lin CC, Yang JC. Safety of gefitinib in non-small cell lung cancer treatment. Expert Opin Drug Saf 2016; 15: 993-1000. Mizoguchi K, Nakamura Y, Sano K, Sato S, Ikegami Y, Motoshima K, Takemoto S, Ogawara D, Senju H, Sugasaki N, Ikeda T, Yamaguchi H, Nakatomi K, Fukuda M, Izumikawa K, Mukae H. Pharmacokinetic parameters of gefitinib predict efficacy and toxicity in patients with advanced non-small cell lung cancer harboring EGFR mutations. Cancer Chemother Pharmacol 2016; 78: 377-382. Jackman D, Pao W, Riely GJ, Engelman JA, Kris MG, Janne PA, Lynch T, Johnson BE, Miller VA. Clinical definition of acquired resistance to epidermal growth factor receptor tyrosine kinase inhibitors in non-small-cell lung cancer. J Clin Oncol 2010; 28: 357-360. Karlovich C, Goldman JW, Sun JM, Mann E, Sequist LV, Konopa K, Wen W, Angenendt P, Horn L, Spigel D, Soria JC, Solomon B, Camidge DR, Gadgeel S, Paweletz C, Wu L, Chien S, O'Donnell P, Matheny S, Despain D, Rolfe L, Raponi M, Allen AR, Park K, Wakelee H. Assessment of EGFR mutation status in matched plasma and tumor tissue of NSCLC patients from a phase I study of Rociletinib (CO-1686). Clin Cancer Res 2016; 22: 2386-2395. Ulivi P, Delmonte A, Chiadini E, Calistri D, Papi M, Mariotti M, Verlicchi A, Ragazzini A, Capelli L, Gamboni A, Puccetti M, Dubini A, Burgio MA, Casanova C, Crino L, Amadori D, Dazzi C. Gene mutation analysis in EGFR wild type NSCLC responsive to erlotinib: are there features to guide patient selection? Int J Mol Sci 2014; 16: 747-757. Golubovskaya VM, Huang G, Ho B, Yemma M, Morrison CD, Lee J, Eliceiri BP, Cance WG. Pharmacologic blockade of FAK autophosphorylation decreases human glioblastoma tumor growth and synergizes with temozolomide. Mol Cancer Ther 2013; 12: 162-172. Sawada J, Li F, Komatsu M. R-Ras protein inhibits autophosphorylation of vascular endothelial growth factor receptor 2 in endothelial cells and suppresses receptor activation in tumor vasculature. J Biol Chem 2015; 290: 8133-8145. Vacondio F, Carmi C, Galvani E, Bassi M, Silva C, Lodola A, Rivara S, Cavazzoni A, Alfieri RR, Petronini PG, Mor M. Long-lasting inhibition of EGFR autophosphorylation in A549 tumor cells by intracellular accumulation of non-covalent inhibitors. Bioorg Med Chem Lett 2013; 23: 5290-5294. Yu HA, Arcila ME, Rekhtman N, Sima CS, Zakowski MF, Pao W, Kris MG, Miller VA, Ladanyi M, Riely GJ. Analysis of tumor specimens at the time of acquired resistance to EGFR-TKI therapy in 155 patients with EGFR-mutant lung cancers. Clin Cancer Res 2013; 19: 2240-2247. La Monica S, Madeddu D, Tiseo M, Vivo V, Galetti M, Cretella D, Bonelli M, Fumarola C, Cavazzoni A, Falco A, Gervasi A, Lagrasta CA, Naldi N, Barocelli E, Ardizzoni A, Quaini F, Petronini PG, Alfieri R. Combination of gefitinib and pemetrexed prevents the acquisition of TKI resistance in NSCLC cell lines carrying EGFR-activating mutation. J Thorac Oncol 2016; 11: 1051-1063. Fiala O, Pesek M, Finek J, Svaton M, Minarik M, Benesova L, Bortlicek Z, Kucera R, Topolcan O. Pemetrexed versus erlotinib in the second-line treatment of patients with advanced-stage non-squamous NSCLC harboring wild-type EGFR Gene. Anticancer Res 2016; 36: 447-453. Kucharczyk T, Krawczyk P, Powrozek T, Kowalski DM, Ramlau R, Kalinka-Warzocha E, Knetki-Wroblewska M, Winiarczyk K, Krzakowski M, Milanowski J. The effectiveness of pemetrexed monotherapy depending on polymorphisms in TS and MTHFR genes as well as clinical factors in advanced NSCLC Patients. Pathol Oncol Res 2016; 22: 49-56. Dal Bello MG, Alama A, Barletta G, Coco S, Truini A, Vanni I, Boccardo S, Genova C, Rijavec E, Biello F, Bottoni G, Sambuceti G, Grossi F. Sequential use of vinorelbine followed by gefitinib enhances the antitumor effect in NSCLC cell lines poorly responsive to reversible EGFR tyrosine kinase inhibitors. Int J Cancer 2015; 137: 2947-2958. Jiang Y, Yuan Q, Fang Q. Schedule-dependent synergistic interaction between docetaxel and gefitinib in NSCLC cell lines regardless of the mutation status of EGFR and KRAS and its molecular mechanisms. J Cancer Res Clin Oncol 2014; 140: 1087-1095. Ma Y, Xin S, Huang M, Yang Y, Zhu C, Zhao H, Zhang Y, Chen L, Zhao Y, Li J, Zhuang W, Zhu X, Zhang L, Wang X. Determinants of Gefitinib toxicity in advanced non-small cell lung cancer (NSCLC): a pharmacogenomic study of metabolic enzymes and transporters. Pharmacogenomics J 2016; 17: 325-330.